In the latest issue of "Monitor Switzerland," which is published today, Credit Suisse economists examine Switzerland's growth prospects and confirm that the country's economic growth is likely to continue accelerating into 2018. Export earnings are rising thanks to a weaker Swiss franc and robust economic activity in destination countries. The improved earnings situation can in turn be expected to boost investment activity. Although the pace of growth in private consumption may not increase next year, private consumer demand remains solid thanks to falling unemployment and improving consumer sentiment. The tourism industry is also gaining traction again after several years in the doldrums. Individual tourist destinations have shown a varying degree of resilience to economic and currency fluctuations in recent years. "Large sections of the Alpine region were hit hardest by the Swiss franc's repeated bouts of appreciation," says Credit Suisse tourism expert Sascha Jucker. Hotels in the Alpine region accommodate an above-average number of independent European travelers, who are very price-sensitive. The attractive euro also meant that destinations in the Swiss Alps lost a large number of domestic customers to their French and Austrian competitors. The mountain regions lacked early and persistent snowfall in the last two winter seasons, making the situation even more difficult for the hotel and catering sector as well as for mountain railway operators. Climate change means that only a minority of winter sports destinations will enjoy naturally guaranteed snow in the long term. Although artificial snow-making does help, it also raises investment and operating costs for the many embattled mountain railway operators. In combination with better snow conditions, the economic recovery in Europe and a weaker Swiss franc could ensure that the 2017/2018 winter season turns out better than that of previous years. However, the hotel and catering sector as well as mountain railway operators will continue to face a challenging situation in the medium to long term, including against the backdrop of the sharp decline in visitor numbers seen in recent years. The situation differs sharply for many hoteliers in the cities, where there was no significant fall in the number of hotel stays even during periods when the Swiss franc was surging in value. 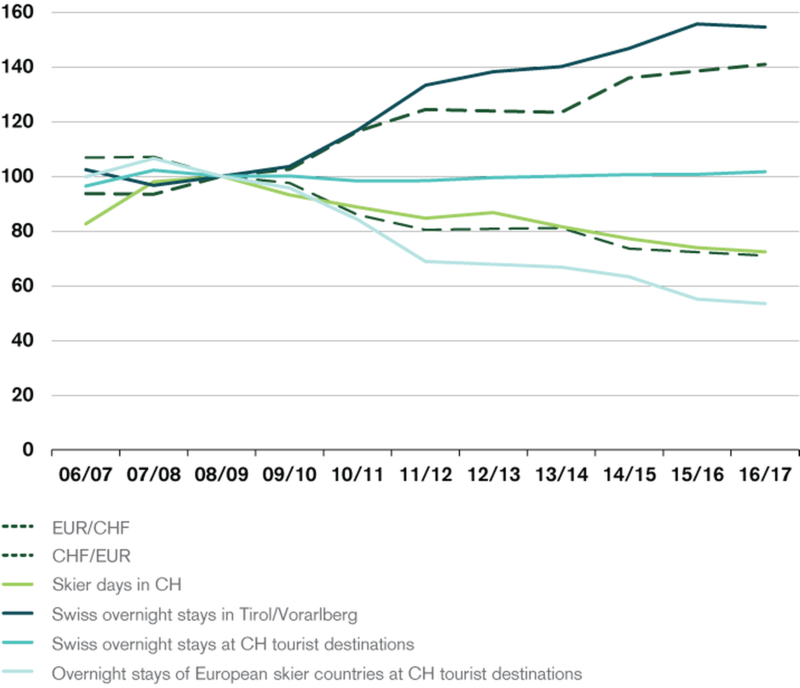 Here, less price-sensitive business tourism from Switzerland and Europe, coupled with the global trend to city breaks, had a stabilizing effect. The visitor mix has improved in recent years, partly on the back of dynamic flows from Asia. Independent Asian tourists are high-spenders who are more likely to stay in luxury hotels in the cities. With the exception of a number of cities, demand from Asian and above all Chinese tourists was nevertheless concentrated almost exclusively on Central Switzerland and the Bernese Oberland, with their internationally famous mountain destinations. This situation is unlikely to change much either, given that the "Tour de Suisse" taken by Chinese group travelers starts in Zurich, Rome, or Paris, and usually passes through Lucerne and Interlaken. What's more, the tourist offer across much of the rest of the Alpine region fails to meet the current needs of Asian group travelers. The contribution made by mass tourism to value creation within the sector itself as well as to the overall economy is expected to remain fairly minimal: Upscale hotels, high-end restaurants, and the transportation sector – with the exception of mountain railways at the above-mentioned tourist spots – derive very little benefit from the low-cost traveler segment. Moreover, the independent tourists who pay a substantial premium to vacation in Switzerland and accordingly expect a certain exclusivity may regard these large numbers of group travelers as a negative factor. However, Sascha Jucker notes that "The tourists visiting Switzerland as part of a group today will be the independent travelers of tomorrow; longer-term, they are therefore likely to generate greater value creation for the hotel and catering sector as well as tourism-related industries. Encouraging this trend should be a priority for Switzerland as a tourist destination."